Many of us are in the same boat. We either live in an apartment, townhome, or condo. This typically means we all have kitchen space that could be a little smaller than we would like. If this is the case, some issues and complaints will be hard to appease. However, many others can be solved by some thought and ingenuity. There are now many companies that are aware of the abundance of compact kitchen spaces and have created products that can help ease the pain of a lack of space. There are also very good designers and architects that have come up with great ways to use illusion and natural elements to make a kitchen feel larger and more useful. Lighting of any space is very important. Small greenhouses can feel quite large, whereas even a large gym feels immensely smaller when dark. Natural light is always the best way to make a living space feel larger. Adding natural light can be as simple as removing unnecessary blinds or drapes covering windows in and around the kitchen. Spending money on adding additional windows or skylights, or just making existing windows larger can be space changing. Adding additional fluorescent lighting throughout the kitchen also helps. Adding under cabinet lights can be most effective in terms of creating the illusion of more space. Utilizing the countertop also becomes easier when the lighting is better. It has been thought that using whites and brights for colors in a kitchen was the only way to make it feel larger. Most designers believe that what is most important with color is choosing something that is a pale color or white. This allows the light in the space to reflect off of the paint color on the walls and cabinets. Adding bold colors in moderation can lead to a space feeling larger if done correctly, but too much can be distracting. Regardless of which pale color you choose, if you decide to make both the walls and cabinet colors the same, it keeps the eye moving up and down the room and gives it a larger illusion. Other great tips in giving a larger illusion involve the use of lines. Diagonal floor tile lines leading to a larger space help to give the larger feel. Vertical lines in cabinetry, backsplashes, and walls make the eye look upward which leads to the illusion of a larger space. 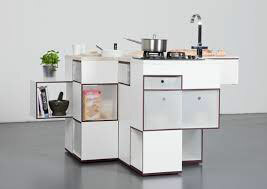 Carefully choosing the design, tones, and colors of the kitchen is a very important step to giving the larger illusion. Open shelving is a great way to give your home a modern feel while also making it feel much larger. When looking at a traditional kitchen the eye sees the kitchen as everything outside of the cabinets. Open shelving takes the eye back to the actual wall and the additional lighting also makes the space feel and look much larger. Traditional cabinets also need room for all the doors to open, whereas open shelving needs no door space. There are now many options for this design feature and can be personalized to your size and taste. If open shelving is too much for you, glass doors on cabinets can give the same visual effect. One thing that definitely helps a smaller kitchen space is de cluttering. This goes for anything in excess in the kitchen. If it is not essential, or something you use on a daily basis it should not even be considered. De cluttering is also very important if you go with the open shelving concept. Plates and glassware must be minimalized and very neat and clean. Uniform really helps with this as well. There are countless new and improving tools and unique ideas to help with kitchen space and efficiency. I will discuss a few easy ones here. Utilizing specialized deeper counters really helps a kitchen gain useful space. It gives a kitchen much more countertop space to utilize for cutting, cooking and organizing and it also provides for deeper cabinets providing more storage space. Rolling islands are a great solution for the need for more space. They can double as lower cabinets and roll out. The top can be a cutting board for easy to clean prep surface, or just a serving table for plates, food, and drinks. Whether you are making small alterations or doing a full blown remodel, taking time with all decision details will help with the feel of the space. Make sure you make the space personal, but always follow the tried and true design guidelines to help your space feel the best. Appliances are also always evolving and the selection and uniqueness always become more abundant. Look into what new ideas could help your space become more efficient and useful but also help your space feel the way you always wanted.